Give your servers some extra grip with this 16" black round non-skid tray. 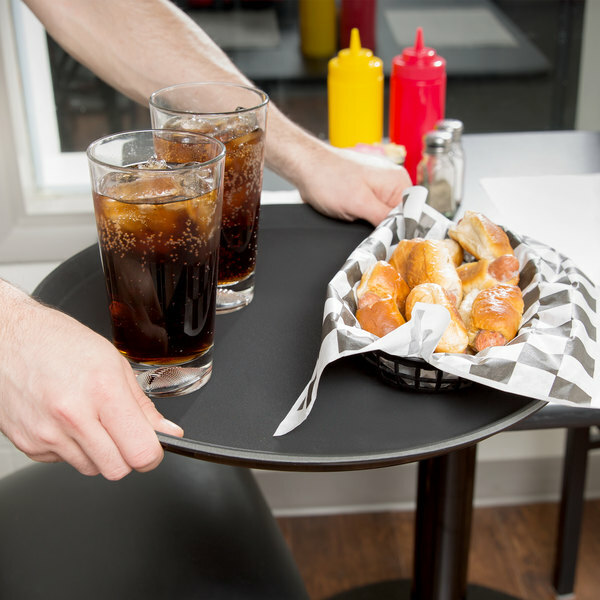 Avoid troublesome spills that disrupt your dinner service and rack up replacement costs with this handy non-skid serving tray! 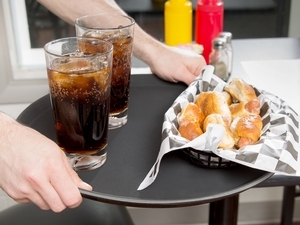 The non-slip lining on top of this classic black tray gives your wait staff peace of mind when navigating a busy restaurant with an order full of drinks and food. Thanks to its large size, you can be confident that there's plenty of room to hold multiple plates and glasses. "This tray is a good size and weight. It is non-skid without being ridged or sticky. The trays look nice and are easy to clean." The top and sides are coated in a rubber-like material that clings to glasses and dinnerware for a reliable grip. The tray features raised edges for added assurance in preventing your dishes from sliding off the side. 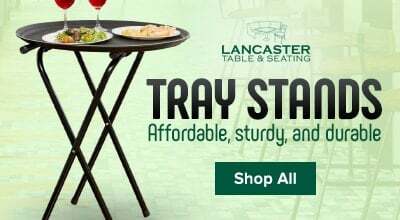 This tray is made of durable yet light weight plastic so that it remains easy to carry without bending under heavy plates. Its rugged design is capable of withstanding temperatures up to 150 degrees Fahrenheit, making it a fine choice for carrying hot plates of steamy food or hot mugs of coffee. This serving tray is well finished and its size makes it suitable to transport drinks, small dishes are to clear out tables. Easy to clean and light to move around. This is a huge help for us. We use these to carry out our tacos on to tables. The cover on them keep items from sliding all over the tray. I use these things all the time and I love them. They are great for food and drink, and are easy to clean and easier to store! Very good quality. The 16" is great. Not too big, not too small. Sturdy and the grip finish is a good touch. Purchased two of these. Very nice trays that are not heavy. 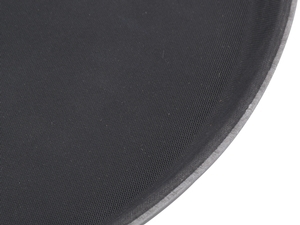 The surface keeps plates and bowls from skidding as the surface is not slippery. Nice, clean black look. When we get those big orders this tray helps us carry food, drinks, bottles and shots. It's also very lightweight, and easy to carry around. Our restaurant was having a lot of issues with trays we have purchased in the past with cork based bottoms. This non skid tray eliminates all those problems and provides a sleek and elegant look. The tray is lightweight and perfect size for carrying appetizer plates or a larger parties drinks on. We use this for cocktail service. Does appear to be pretty non-slip. We run it through the dishwasher and it has held up well. Overall, a good product. These are very well made non skid serving trays! 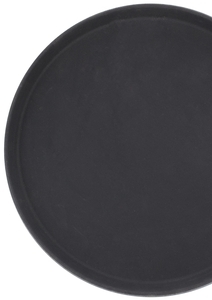 They are simple, durable and with well enough grip so that glasses and plates won't slide off. These are your basic restaurant/bar/catering trays. They are just like any one I’ve ever used, but I will say they are a great deal. I bought a few for the servers to use at my wedding since we are doing all the food on our own and hiring servers. These will work great. This trays are nice and sturdy. It’s nice that they don’t skid and pretty much stays in place. Light not heavy at all. Great product. 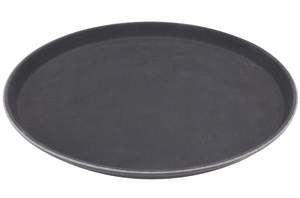 This tray isn't huge, but it's great for serving drinks or small plates without an unwieldy, huge tray. The non skid is very effective, even when wet. Great and sturdy product. Easy to wipe off messes or run thru the dishwasher. Great material and grips drinks to balance when delivering to customers. This is a larger version of the 14" serving tray. It grips to my hand well and drinks won't slide off of it. I prefer the 14" for carrying, but I'm no pro. 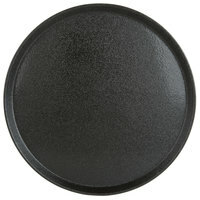 These 16” serving trays are of great quality and are a really good size for the price. Easy to wash and take care of as well. 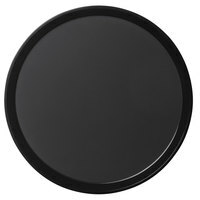 Are you serving trays are great they’re built strong and they’re built to last. There light and I would recommend this for all types of restaurants . 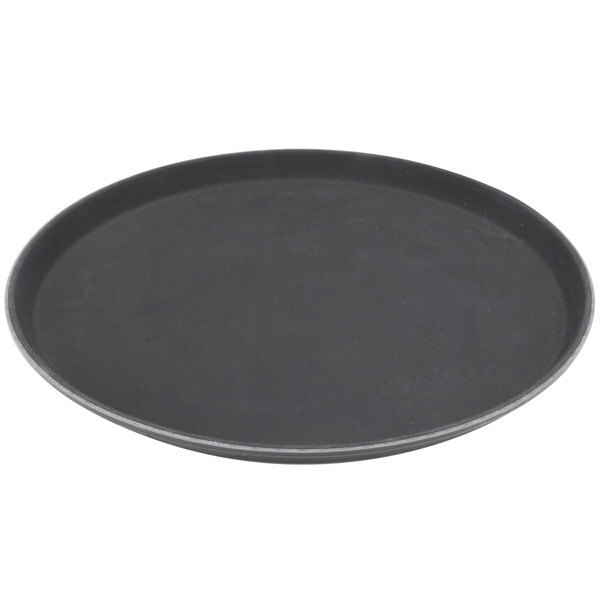 These non skid serving trays are great! They work like they are supposed to. The non skid surface on them really have a lot of bite on them. Good size and weight, however the non-slip surface makes them very hard to get properly clean from the inevitable spills that will occur. After only a couple of months of use these started to look like they needed replaced. 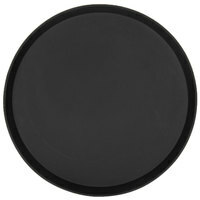 Big round one, great shape, and really hard material, works perfect the non skid for glasses and plates, the size is the perfect size to work with, Really Recommend this one!! Great cocktail tray with well laid out grip cover. Easy to clean, but recommend running them through the dish machine because they don't take to bar mops or hand towels very well.